There was a big fire recently which burned down a home. There were many canines and felines in the home along with the humans. The entire home was destroyed, but all of the residents, both two legged and four legged, were safe. 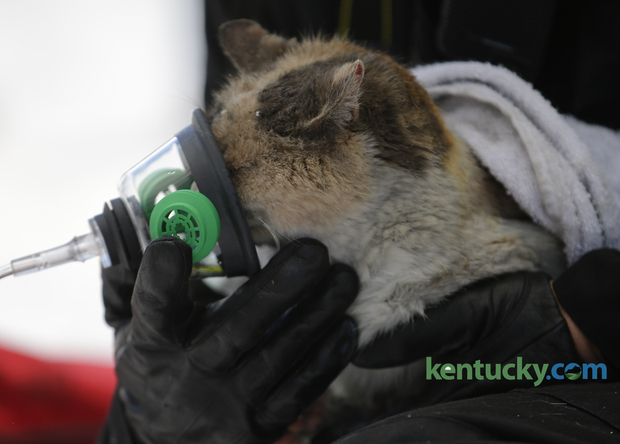 During the part of the firefighting that involved cat rescues, one of the firefighters had his picture taken giving oxygen to one of the cats that was saved. You know how cat pictures have taken over the internet these days. It should not come as a surprise that the picture spread far and wide and many humans were happy to see the picture of the cat rescue. A video of the cat rescue made its way all the way around the world, to Australia. This resulted in the firefighter in the video being contacted by an Australian news program for an interview. The firefighter said he was amazed that the video got him an interview with a news program from all the way around the world. During the interview, he was asked about the cat rescue. He also was asked about another animal rescue he was involved in. A couple of years ago, a canine was badly injured and his human caretaker could not afford to pay for treatment. Another firefighter paid for the surgery, and this firefighter helped find a good home for the canine. It is clear from the cat rescue and this that he is a fan of four legged creatures.